Lizards do not know how to breathe under water – at least, scientists believed so earlier. Not so long ago, however, scientists discovered that lizards of the species Anolis oxylophus are capable of it. Experts were able to photograph the underwater breath of one of these amazing lizards on the video. 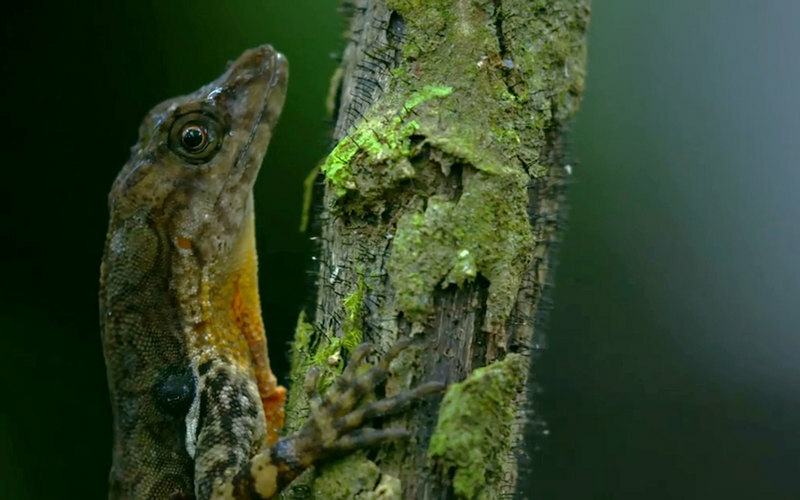 For more than a year, biologists Neil Losin and Neith Deppen (Nate Dappen) traveled the world making a film dedicated to anoles, a genus of iguano-formed lizards that live in the American tropics. Scientists already know a lot about these creatures – thousands of studies have been devoted to their research in the last 50 years. As it was known to specialists, Costa Rican lizards Anolis oxylophus are able to submerge in water for about 15 minutes. Scientists – at the request of a biologist from the University of Toronto – decided to see what exactly these animals are doing during these dives, and analyzed the video. At first, Luzin and Deppen did not notice anything remarkable, however, after looking more attentively, they saw something amazing. The female Anolis oxylophus, which appeared on the video, was at the bottom of the river for about 10 minutes – and at that time, as you can see, a small bubble expanded and re-tightened on her head. Thus, the lizard, apparently, processed the air – about the same as it does with the rebreather (insulating breathing apparatus). As Deppen explains, recycling the stored air allows Anolis oxylophus to dive in for a sufficient time to escape, for example, from any land-based threat. How exactly this unusual underwater breathing occurs in these lizards is not yet clear, but researchers are just now studying this behavior.